Dear Readers: Welcome to the August – September 2016 issue of Shine On Hollywood Magazine (SOHM)! As we say goodbye to Summer and hello to Fall, we boldly move forward and bring to you with anticipation, our first ever issue featuring Top Chef/Culinary Industry Professionals. There’s never shortage of talent in this town, as we present you with delicious inspiring stories from the gourmet kitchens of Hollywood and beyond. 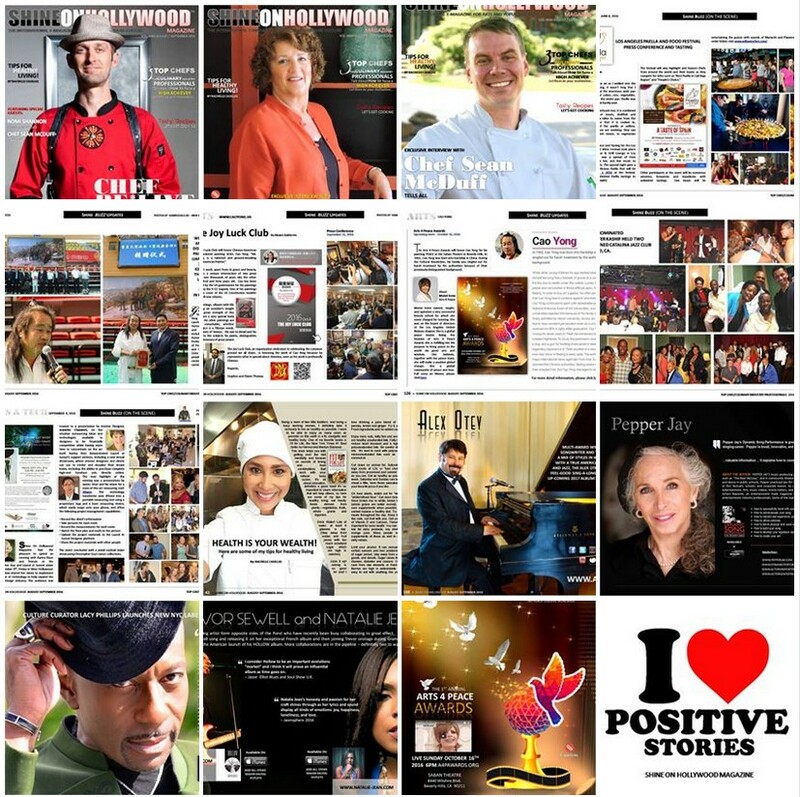 This month’s cover story features celebrity Gourmet Raw Vegan Chef, Be*Live. Brian James Lucas was born with dental and gastrointestinal disorders that threatened his life during childhood. Later as an adult facing legal troubles, and without formal culinary education, his initial investment in a raw vegan restaurant gave him the opportunity to develop his innate skills, and eventually Lucas reinvented himself using the new social media technologies, building a following as a celebrity chef and a pioneer of the gourmet raw vegan movement. If you’re curious about Raw Cuisine you won’t want to miss this article! Next up is Nomi Shannon, a living pioneer of the modern Gourmet Raw Food movement. After a series of health complications, Nomi gradually became a full Raw Vegan. After graduating from college at the age of 40, she became an educator in body cleansing using the raw lifestyle and recipes. Now at age 73, she’s in the best shape of her life running her own successful online business and has earned awards and accolades from the Raw Vegan community for her work and groundbreaking cook books. For those health-conscious readers interested in switching to “Raw,” look for tips on how to best make this salubrious decision. This month we are also featuring Chef Sean McDuff, who dropped out of school at the age of 17, and quickly realized the value of education. He went on to complete his GED. Sean found an interest in cooking and continued his journey by enrolling in the Art Institute of Atlanta, where he would go on to study the culinary arts. By the age of 20, Sean was winning awards and working in some of the hottest kitchens in the Atlanta area. He then went on to found Live2EatWell, a meal delivery service that offers an opportunity for families to eat healthy, locally-sourced, prepared meals in an effort to improve their well-being. We encourage you to “Let them be your motivation!” SOHM remains a politics and gossip free publication with its focus on, Real People, Real Stories, from the Arts and Pop Culture Community who make a difference by giving back, and we are delighted to share their heart-felt stories with you. We will continue to provide the industry’s foremost creative meeting place with monthly showcases, news, opinions, analysis, and audience feedback. Next issue will feature an emphasis on Top Humanitarians and Philanthropists. Look for exclusive interviews with some of the hardest working men in the industry. Next Next post: Bitcoin Games pay out hundreds of Bitcoin every month! Ozzmak News – Real Time Artists Promotion Blog at WordPress.com.